Himalayan Yeti "The Abominable Snowman". Measures approximately 1-5/8" tall. Wild Turkey Male Gobbler- "Gooble-Up" these O-Scale feathered friends before they 'fly the coop'! Turkey measures approximately 5/8" from head to ground and approximately 3/4" from his feathered-fan tail to the ground. Approximately 1/2" wide. Vintage Paperboy - O-Scale. Complete with vintage cap, suspenders and knickers this young chap bellows out the latest news "Scenic Express - Your #1 "One-Stop Shop" for Model Landscaping Scenery Supplies!". Measures approximately 7/8" tall. O-Scale Turkey In Flight - On his way into flight to check out where the seductive call of his mate is coming from! Measures approximately 1-1/4" from head to tail feathers and also wing span. Station Porter with Luggage - O-Scale. 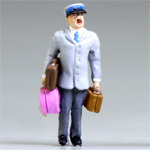 If traveling by train, be certain to find a dapper man such as our station porter to assist with your baggage. 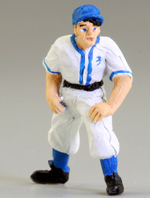 Porter stands approximately 1-1/2" tall. 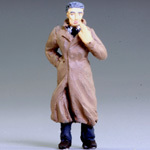 O-Scale Smoking Man in Trench Coat - "I-Spy". Is he a British Army Officer or just seeking a businesslike respectability? 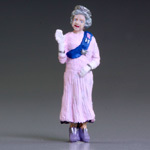 Measures approximately 1-1/2" tall. 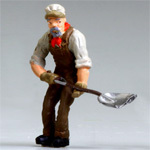 O-Scale Hillbilly With Shotgun - "PAPPY YOKUM" sits approximately 1" high. Put him in the cornfield looking for the next varmint to shoot or on the front porch as he awaits his daughter's boyfriend! His long beard covers most of his chest with the extra thrown over his shoulder. 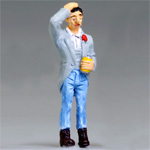 Figure wears plaid shirt, denim jeans, straw hat and "Thunderbuster" included!!! O-Scale Running Hillbilly Guy - 'Lil Abner' runs away from our voluptuous "Hillbilly Girl" (Daisy Mae - EX0304) trying to evade the grips of matrimony! Figure approximately 1-1/2" tall. Figures sold separately. Colors may vary! O-Scale Running Hillbilly Girl - "Daisy Mae"!-What guy wouldn't stop dead in his tracks being sought after by this voluptuous, barefoot, blonde-haired beauty? 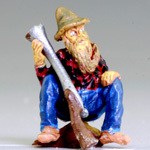 Hillbilly Girl is approximately 1-1/2" tall. 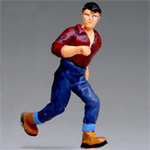 See also "Running Hillbilly Guy" ('Lil Abner EX0301). Figures sold separately! Colors of clothing may vary.